With Cristiano Ronaldo assisting from the audience, Real Madrid won 2-0 against Hércules tonight, with a brace by Karim Benzema. The "Merengues" are now four points behind league leaders Barcelona, who plays their match tomorrow, against Sevilla. 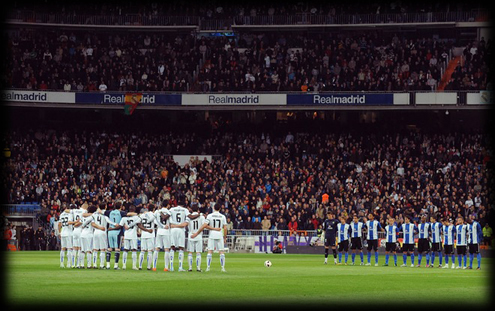 The game started with both Real Madrid and Hércules players holding a minute of silence in respect for the victims of the recent earthquake in Japan. Then the game started and Real Madrid did enough to earn a solid victory, thanks to a brace by Karim Benzema. Real Madrid will now focus on the match against Olympique Lyon, to be played in the 16th of March, counting for the UEFA Champions League Round of 16, on which Cristiano Ronaldo is expected to play. Karim Benzema was decisive, yet again by scoring the two goals that Real Madrid a 2-0 victory over Hércules. Benzema is showing critics that he is a true great player, of innate quality that has allowed him to become one of the best strikers in Europe, as he had proved before while still playing for Lyon. Benzema is worthy of playing for Real Madrid despite criticism that said he had run his course on the team. These people must now keep silent and swallow some words. Real Madrid stepped onto the pitch with next Wednesday's UEFA Champions League match against Olympique Lyon in mind. The immediate signs of that, were seen as José Mourinho benched Xabi Alonso and Pepe, allowing Granero and Arbeloa to make the starting lineup. Hércules created good ball movement, but Real Madrid dominated the match, patiently waiting for a chance to score. Ozil received the ball right outside the box and passed it to Arbeloa, who entered the area and served a perfect assist to Karim Benzema, who in turn defeated Hércules keeper Calatayud with ease, around minute 23. Hércules didn't suffer much from the strike and tried to net an equaliser several times to no avail. Their best chance was thwarted by an inspired Iker Casillas, who cleared the ball in an individual effort by Kiko Femenia. As soon as the second half started, similarities could be found with the first half. Hercules once again showed some good touch on the ball, but rarely approached Real Madrid's box with real danger. Real Madrid tried to score another strike to seal the match, and Karim Benzema eventually did it on the minute 55. The French striker controlled the ball just outside the box, entered the area and fired a dry and strong shot that surprised Hércules keeper. The game was sentenced then and José Mourinho decided to make Xabi Alonso and Sami Khedira come on for Angel Di Maria and Granero. Sergio Canales also came on for Mesut Ozil (who received a standing ovation) when there were still 12 minutes to be played in the game. Adebayor and Benzema had more chances on goal, but they were all denied by an inspired keeper in the final minutes of the game. Real Madrid are now four points behind the leaders and will start preparing Wednesday's match against Olympique Lyon, in the second leg of the UEFA Champions League, round of last 16, at the Bernabéu. The most awaited return will obviously be Cristiano Ronaldo, who missed the last two Real Madrid matches due to the injury suffered in the match against Málaga, but will certainly make his presence noted in this very important match against Lyon.